Many people wish they could find that elusive copy of the Declaration of Independence which recently sold for over $8 million. While they may not find such a valuable antique, the tips in the Complete Idiot's Guide to Buying and Selling Antiques by Emyl Jenkins are a treasure for any beginning collector. 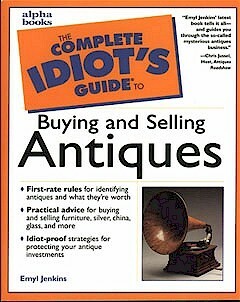 In her introduction, Jenkins claims, "If an idiot like me can learn the secrets to antiques, you can, too." Jenkins is no idiotunless she wrote this book for far less money than she should have. She's a 30-year veteran of antique appraising, covering everything from valuable pieces for Winterthur to the charred remains of fires for insurance companies. Her new book dispels the myths surrounding antiques created by the "Antiques Roadshow." Not everything is valuable and not everything is an antique. Period. This well-thought-out guide for the novice antique collector also offers intermediate collectors all sorts of tips, especially how to deal with today's international antique marketplace. Beginning with how to tell if a piece is actually an antique through the art of buying and selling , Jenkins takes the novice on a plotted course through the antiques mine field, writing in a simple, no nonsense style. As with other Idiot's Guides, Jenkins gingerly peppers her book with illustrations of specific pieces, as well as little tidbits in sidebars like AntiqInfo"It isn't unusual for a piece to be sold in less than two minutes." AntiqClues"The first place to look for clues about style of furniture is legs and feet." And Before You Buy"A tape always comes in handy when considering a large Victorian Renaissance Revival piece." She divides information into manageable chunks. But don't go looking for in-depth coverageyou won't find it here. This book is a great introduction for the novice collector and a good overall view. With it in hand, anyone can begin collecting wisely.